Rose & Clive is new venture that popped up in Cheltenham just three weeks ago. Mini KidTown and I popped by to see what it's all about. 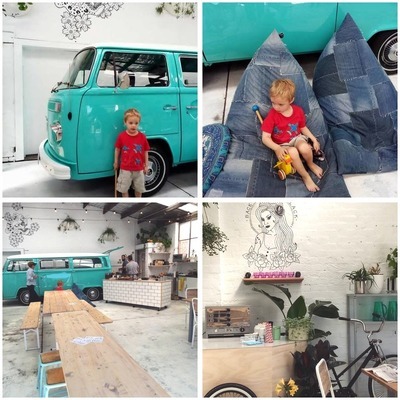 Operating as a 'roaming canteen' this bright and airy open space is home to a pristine turquoise Kombi van serving takeaway coffees, chais, bounty hot chocolates (which are amazing by the way) babycinos and the like. Foodwise, expect lunchtime snacks; toasted sandwiches, pastries and home baked empanadas aka 'Spanish pies' cooked fresh in Brunswick by the owner's mother! Rose & Clive is not so much a cafe, but a space to show off their mobile food services catering greater Melbourne. 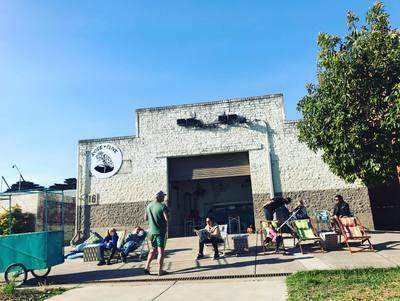 That said, this light warehouse-style space, tucked away in a suburban street in Melbourne Southeast is a welcoming venue for families open every day of the week. 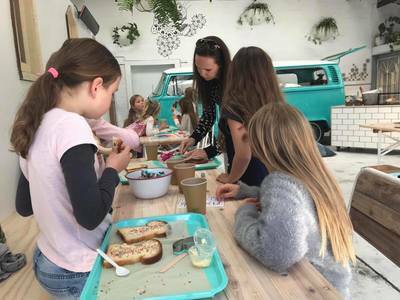 With a basket filled with toys, upcycled denim bean bags to lounge about on and DIY fairy bread* kiddies love it here as much as Mums and Dads enjoy the serenity. Swing by if you're in the area. Rose & Clive is open 7am - 2pm on a Monday and 7am - 3pm Tuesday - Sunday.